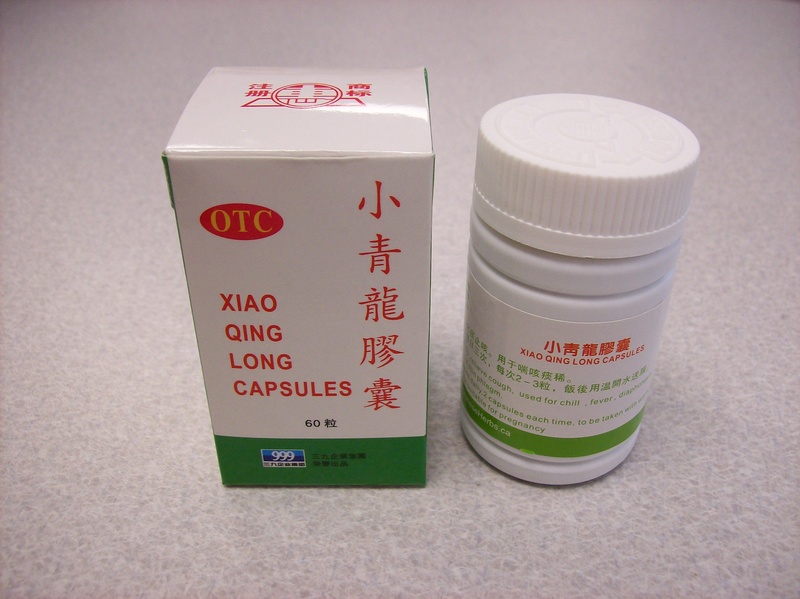 Xiao Qinglong Wan is one of the most famous Chinese herbal formula in clinic. It is basically used for a clinic phenomenon in which patients feel cold or fever (more cold than fever), have more clear running nose, asthma (the asthma is so severe that the patients feel hard to lie evenly at night for a sleep). They may also have swelling here and there in the body (so called local swelling) without thirsty (it is very important that patients have no strong thirsty). Such phenomena can be seen in lots of clinic conditions (e.g. diseases diagnosed by western medical system), so that it is used in large various clinic conditions. Here we introduce some of the clinic conditions in which the Xiao Qinglong wan (wan mans pill in Chinese) works very well. It should be pointed out that ANY Chinese herbs should be used according to Chinese herbal therapy. It means that it should be used according to a diagnosis by Chinese medicine, not by a western medicine. Information here for the introduction of clinic effectiveness of herbs is to show how good they are in the treatment of various “diseases”, but in the TCM view, it works in so many clinic diseases simply because all of the effective cases showed a common phenomenon: Cold syndrome with water accumulation on the concept of Chinese medicine. Therefore, readers should not ask me the question as “Dr. Martin, can I use this pill for my asthma…?” If you ask me in this way, I will tell you that you have to come to let me see if you belong to such Cold syndrome with water accumulation. In this article, “cured” means the patients have no more similar symptoms for years. “Effective” means the illness is pretty much under control. The reports are all from clinic journals published in China in Chinese, so that the source of data is omitted here. In a group of total 28 cases with such spring allergic eye infection, the herbal pill made 10 patients cured, 16 is under clinic control with only 3 cases no effect. In this group, patients in both herbal group and western medicine group are treated for 4 mouths. The western medicine drug used is Prednison.